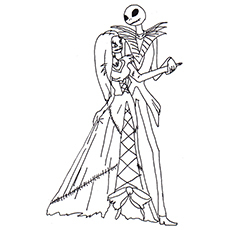 The Nightmare before Christmas is a famous and much-loved 1993 stop motion musical fantasy film. 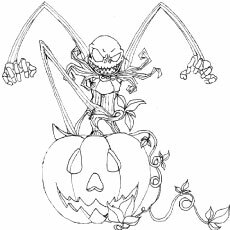 The story is set in Halloween Town, a fantasy world which houses characters like monsters, ghosts, goblins, vampires, werewolves and witches. 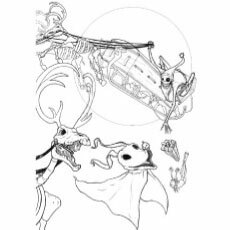 The story is about the residents of the town discovering the spirit of Christmas. Due to the fantasy theme that the movie follows, it offers a good number of opportunities for you to create fun activities for your kid. 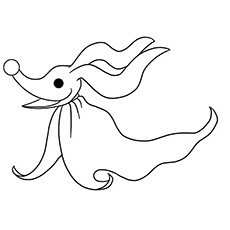 One such activity is coloring. 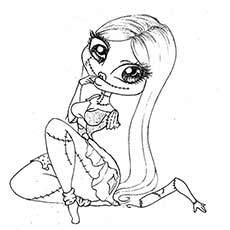 Coloring pages can be a great way to keep your little ones occupied. What’s more, your children are bound to love playing with colors! 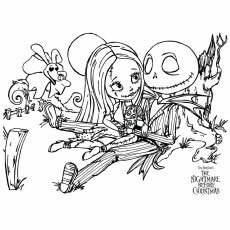 Instead of letting your child watch the movie over and over again, set him or her down with the task of coloring pages that are inspired by the movie! 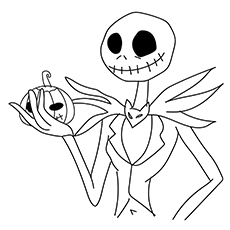 The pumpkin king of Halloween town, Jack Skellington, is a skeleton with a pumpkin head! Help your children relate with the character. Tell them all about his wacky dressing sense and why he dresses that way. 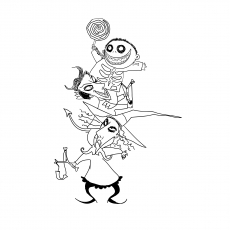 This page features Lock, Shock and Barrel, three mischievous children who have been given the task of bringing Santa to Halloween Town. Tell your children how naughtiness can be used for positive tasks. Teach them to differentiate and choose between being good and bad. 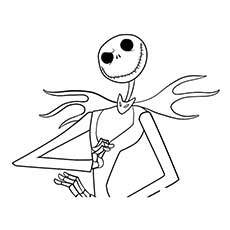 A movie set in Halloween Town is incomplete without cobwebs! Help your children understand the underlying theme of the entire movie, which is depicted clearly in this page. 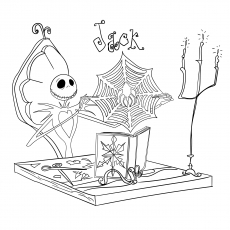 Get your children to appreciate the lighter side when looking at details (like Jack cutting cobwebs from a book with a pair of scissors). The picture shows the many ways in which Jack plays with his dog, Zero. If you have pets at home, your child can easily relate to this picture. 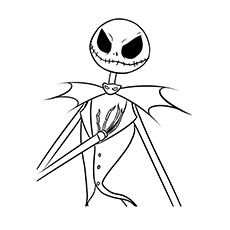 Help your child associate with the positive image of Jack that this page depicts! The cast of the movie has weird looking characters. This drawing is a collage of them all. 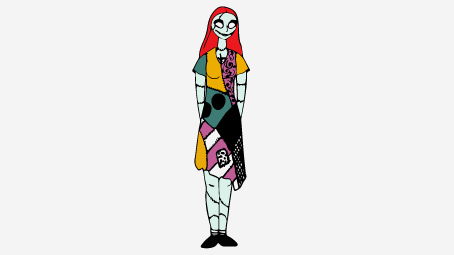 Your child can learn all about color associations while coloring these characters. The weird expressions on the plethora of characters are bound to tickle their funny bone! 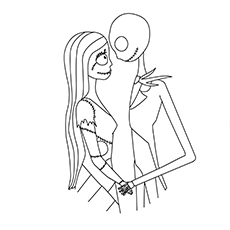 In this drawing, Jack is seen dancing with Sally. You could ask your child about what he or she finds funny in his or her everyday life. Teach them how important it is to laugh and make others laugh. 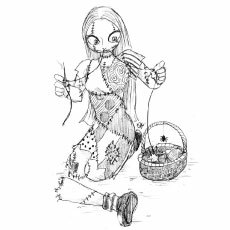 In this drawing, Sally, the ragdoll, is stitching herself up. 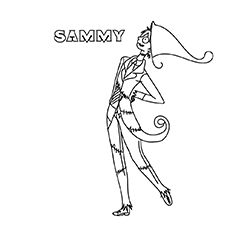 After your child is done with coloring this page, you could ask what he or she thinks about Sally. 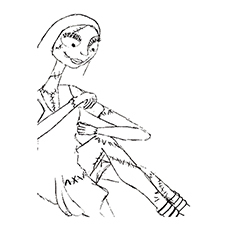 You could also indulge your child in some DIY activities like creating a doll out of some old socks. 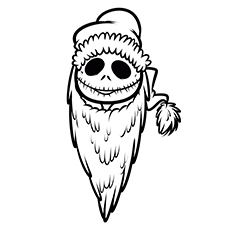 In this drawing Jack is seen taking on the role of Santa Claus. 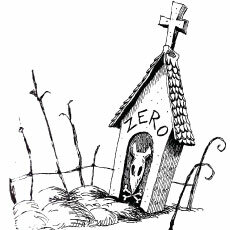 His gifts for children are shrunken heads, vampire teddies, etc., that are meant to scare the children. Discuss the significance of Santa Claus to your child. Also, try to know what is it that your child wants Santa to bring for him? 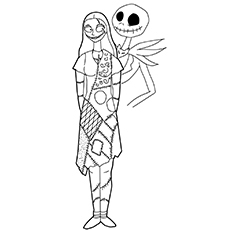 This coloring page shows Jack and Sally together. 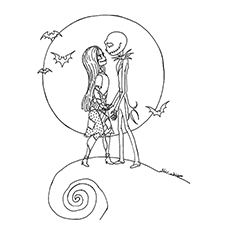 This picture of Jack and Sally on top of the hill in the graveyard is the one which ends the movie with ‘they lived happily ever after’. 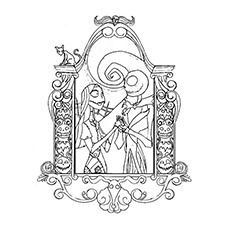 Ask your children to build up on the story after it ends. You will get to hear some interesting stories for sure! 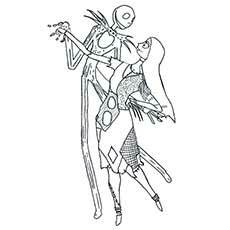 This drawing is a poster of the movie. 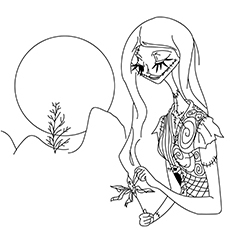 Let this be colored in any way. The movie teaches children to deal with things they are scared of and uses humor to help them overcome many such issues. 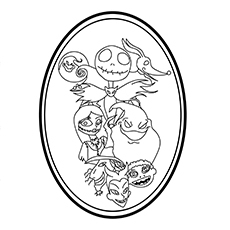 Use these free printable Nightmare before Christmas coloring pages online to help your children understand how to take up the daily challenges that life throws at them. 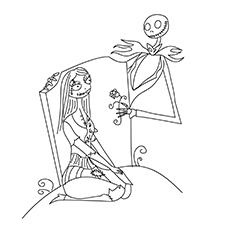 Hope you and your kid will love this collection of Nightmare before Christmas pictures to color. 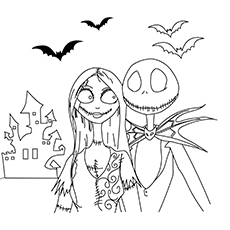 You can also create your own Nightmare before Christmas coloring book. Do share your experiences with us!